Kevin Dempsey has music in his soul. His multi-facetted career is testament to his talent as a guitarist, singer, songwriter and record producer. His uniquely wide range of professional experience in both the UK and the USA provides the bedrock for his unique range of skills. Kev is not only a talented solo performer but also an ensemble player of outstanding ability. He is sought out by many other musicians who enjoy not only his company but also know that his craftsmanship will always seek the most sensitive chord, the perfect arrangement, the ultimate lyrical sound or sheer driving rhythm, all to blend seamlessly into great pieces of music. Alongside his performance commitments Kevin has always produced music, his own and for other artists. He completed ‘Straws in the Wind,’ the most recent album from Martin Carthy and Dave Swarbrick. 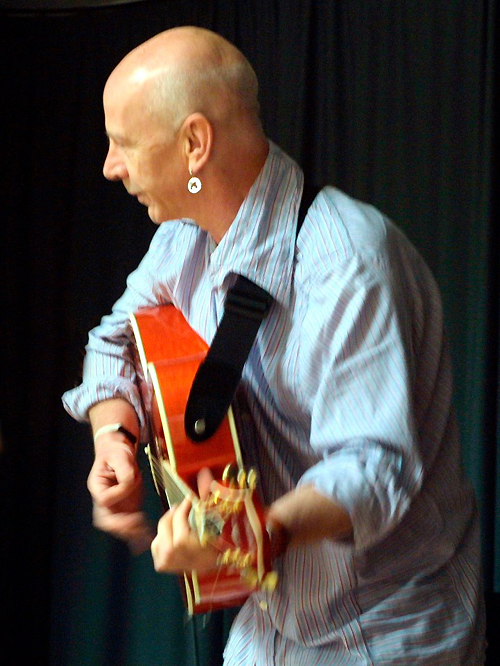 Kev teaches workshops for guitar as well as ensemble playing (which can include song) and has rave notices from pupils. Kev also entered the world of academia in 2011 when he did a very popular teaching day for the folk studies degree at the University of Newcastle. He continues to do summer schools in France and at Somerset’s famous Halsway Manor.